As you know BHS uses iPads as our primary technology for learning, but we also have some Chromebooks for use in the library. 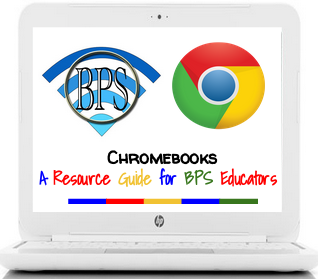 BHS recently got the newest version of the Chromebook that may outshine the iPad in the learning environment. The first thing that struck me that was good about the new Chromebook was how it felt in my hands, unlike the first iteration it felt sturdy and similar to a standard laptop. The trackpad greatly improved and its larger and feels unlike a regular laptop trackpad. The old Chromebooks trackpad was small and inaccurate when moving and clicking. Battery life has improved along with the device becoming thinner and lighter. The OS of the Chromebook was updated slightly also. So how does the new chromebook compare to the iPads we currently have? The iPad 2 boasts a 10 hour battery life while the Chromebook has roughly 6.5. This may sound like a Problem but in my experience even heavy use of my iPad throughout the school day only drains about 50% of the battery life so at 6.5 hours the Chromebook should survive the school day without a needing a recharge. As for storage the iPad comes with 16 gigabytes of storage but is supplemented with the many cloud based applications we use. The Chromebook also comes with a 16 gigabyte solid state drive(actual memory built into the device) but has up to 100 gigabyte storage with the google drive cloud, again this not only compares to the iPad but exceeds it. The Chromebook has full access to all of Google’s services such as Drive, Gmail, calendar, sites, and many others, while the iPad has limited access to just a few of these features such as Gmail, Drive, and search. Since the Chromebook acts as a full computer when on the web browser it has flash and java which the iPad does not support. Another added bonus is a physical keyboard. The new Chromebook’s keyboard is reminiscent of apple’s design: flat and easy to type. I know that the lack of a physical keyboard on the iPad deterred many students and teachers from using it because it was more difficult to type on. With Chromebooks students can write papers, make presentations, and research with greater ease than with the iPad. But as with the iPads there are some drawbacks such as less control over what students do on the devices. On the iPads we have lightspeed and the profiles that keeps students from violating school policy, Chromebooks do not have as much control over limiting content as the iPads do. As great as a learning tool the iPad is, I believe the Chromebook is better suited in a 1:1 learning environment for secondary and higher ed. students. Thanks, Kathy! Look forward to reviewing your post. I really like the direction Google is going with the Chromebooks. Plus, their iOS apps are getting better and better. Google Presentations is the biggest stumbling block for the iPad. It just doesn’t work. The keyboard is the biggest advantage of the Chromebok. However, price is what would really sway me. $250 for the new Chromebook vs. $500 for the iPad. Thanks for this post. We’ll written. Good stuff Andy. We too have a lot of iPads in the district but recently bought a Chromebook for testing. I put it in the hands of a student for use throughout the rest of the year and so far she loves it. One thing you didn’t mention that Chromebook has over the iPad is cost. You can get almost 2 Chromebooks for the cost of 1 iPad. As for control, Google does have an admin panel for the Chromebooks that I have not seen or tried yet. I’m sure you have heard of it. If you’ve used it I’d love to hear what you think of it. I have many i-devices and a macbook air, but am still intrigued by the Chromebook. They’re so cheap too. The issue of control of content is mentioned and both products are identified as coming up short in this area. our experience is that the Kuno tablet resolves this issue with the curriculum loft service. The fundamental problem with the Ipad as well as the chrome book is that they are made for the mass consumer market not as a 1:1 device for school use. The competition of purposes results in the Ipad and other such devices functionality being driven primarily by non ed purposes. A device that is primarily designed for ed with consumer use as the secondary driver is what we really need. The Apple II was the closest thing to this a full generation (human not tech) ago to seriously attempt this. If apple was serious about the ed 1:1 market they could capture it by creating a new device explicitly for this market that was responsive to the school as consumer instead of trying to sell us something that doesn’t actually fit. Hmm..a device specifically for education. I think this is a positive idea in primary grades. However, past primary, the focus is on future success. I’d rather teach my students how to use a device not intended specifically for education because it is what they will need to know in the future. Leaving middle and high school having only used education specific devices is a disservice to the students. You mention that Chromebooks support Java. In our experiences with Chromebooks, and we have over 2400 of them allocated at our high school, Chromebooks do not currently support java. If I am wrong, please enlighten me because that has been our biggest stumbling block. This was my experience too. Wordle, which is Java-based, doesn’t work. That is really the only think that I’ve run into on the Chromebook that has been an issue. I believe you are correct in that the Chromebook does not support Java. You’re correct but according to the Chromebook information, a virtualized instance of java can be utilized on the school network and accessed by the Chromebook to get around this. I’m way thin on the details of how this would work as we are just beginning to explore this in our school system. If your going to virtualize the chrome book then why have it in the first the place, kind of pointless. You have pay for all the licenses and the servers which makes the price point go up also. Java is not supported on Chrome browser because it’s only 32 bit. I’m not sure whether the Chromebook uses a 64 bit version of Chrome. As for Flash, I don’t understand why so many people take this up as an important requirement since a lot of kids waste so much time on flash driven websites with games. Kids will take any opportunity to do a Ctrl-Tab and switch between work and games. The other issue is that Flash websites drive the CPU to smithereens and decreases battery life to a bare minimum. Probably one of the main reasons why Apple decided to take it off iPads and is not installed by default on Mountain Lion. I would like to see some real life graphs showing battery life with flash activity and without. How are Chromebooks as creation devices? We have found the ipad2 device with the iLife Suite still beats everything else out there for creating. Also, heard viruses are a problem. Have you had any issues with that? Viruses are absolutely not a problem on Chromebooks, and that is one of its greatest advantages. Because you cannot download any software (executable programs) the security is within the very secure Chrome OS itself and there is no need for antivirus programs. This greatly reduces maintenance costs for schools. I don’t know what maintenance is involved with the iPad. As for control over content, from what I”ve read school administrators have a great deal of control over content on Chromebooks in their domain. They can determine what web apps/sites are off-limits, push the educational apps to all or subgroups of machines and teachers can eaily monitor all the screens in their classrooms. Of course, all browsing history and emails done through school accounts can be accessed by administrators (as is always the case for school or business domains) so kids should have private accounts (on personal computers) for things they don’t want school officials to see. As to content creation, there are a lot of fantastic web apps for picture editing and video making, although they are not yet to the same level as native software appllications–but they keep improving. We have approx 130 iPads in our K-8 school of 330 students that we rolled out this fall after running a test class last year. With ongoing proper training of teachers/students we’ve found that content creation is not a problem. Those sites that need flash we have found apps or other sites that replaced them in 85% of the cases. The remaining 15% are visited during the classes weekly technology lab, mobile laptop cart, or visited at home. We are currently demoing a Chromebook as replacements for the mobile lab and possibly more in grades 6-8. The Chromebook is impressive and does have advantage in using Google Docs, however, students and teachers agree that the apps put the iPad in a stronger overall position for our school. The Chromebook is worthless without Java support for educational purposes. Try accessing Blackboard, Aleks, OARs or Glogsters, not going to happen. I wouldn’t say worthless, I would just say that if you rely on those things then it isn’t the best solution available right now. But if you are starting from the ground up, as my school system is, then the Chromebook is an exceptionally viable option.